Each week, Big Issues focuses on a newly released comic-book issue of significance. This week, it’s Batman And Robin #18. Written by Peter J. Tomasi (Green Lantern Corps, Nightwing) and drawn by Patrick Gleason (Green Lantern Corps, Aquaman), this silent requiem for Damien Wayne is not only an intense tearjerker, it’s a work of fine art. A silent comic is a difficult thing to pull off. In December of 2001, Marvel Comics had a “’Nuff Said” month where all of its comics were silent, and the results were mixed. A silent issue is the ultimate test of a creative team’s synergy, showing how much a writer trusts an artist to tell the story with just visuals, and revealing how capable an artist is at bringing the writer’s script to the page. Not surprisingly, the most memorable books of ’Nuff Said were by creative teams like Grant Morrison and Frank Quitely on New X-Men, Peter Milligan and Michael Allred on X-Force, and J. Michael Straczynski and John Romita Jr. on Amazing Spider-Man. These ’Nuff Said issues were relatively early in the runs of those teams, but all of their creative relationships blossomed over time. Peter J. Tomasi and Patrick Gleason have been working together for five years now, having started their collaboration on the epic space drama of Green Lantern Corps before moving to the street-level superheroics of Batman And Robin. They’ve been consistently delivering some of the strongest Gotham City stories for the past two years, but Batman And Robin #18 takes their partnership to another level. They create a breathtakingly beautiful, heartbreakingly sad tale of Bruce Wayne coping with the loss of his son, told without text except for a letter Bruce reads at the end of the issue. The masterful artwork of Gleason, inker Mick Gray, and colorist John Kalisz does all the heavy lifting, creating engrossing images that pull the reader into Bruce’s devastated world and expose the hero’s shattered mental state. Damian Wayne’s death in Batman Incorporated #8 was a brutal moment stunningly realized by Grant Morrison and Chris Burnham, but Batman And Robin #18 is where the emotional aftershocks of Damian’s death are felt. It’s an exquisitely staged exploration of grief, memory, and anger that will resonate with anyone who has ever lost a loved one, giving the fan-favorite character the heartfelt goodbye he deserves. Readers who are susceptible to tears should have the Kleenex handy while reading this, because it starts sad and ends in soul-crushing despair. Tomasi and the art team don’t pull any punches with the story, plumbing the depths of Bruce’s anguish to deliver one of the most poignant Batman stories ever put to paper. Patrick Gleason has been an impressive artist for years, but his work with Mick Gray and John Kalisz on this title has shown him to be one of the best visual storytellers in superhero comics. Gleason is like some sort of brilliant Frankenstein’s monster made from the best elements of Mike Mignola, Dustin Nguyen, and Brian Bolland; the fact that he’s able to turn in artwork this good on a monthly schedule lends further credence to the theory that there’s something inhuman about him. He has incredible control of pacing, breaking down moments so that every emotional shift is clearly conveyed on the page. He builds to gorgeous splash pages that are all imbued with a heavy layer of melancholy, no matter how striking the visual. The first splash of Bruce and Titus sitting in front of Damian’s sleeping pad is a somber look at how Bruce is trying to hold on to Damian by leaving his room untouched: Damian’s slippers are still in front of the fireplace, and his MP3 player rests next to the head of the bed. The amount of detail Gleason puts into this one image is staggering, creating a fully realized environment that swallows the reader. The lack of text makes it easy to get lost in the artwork, putting extra attention on each shifting camera angle and focal point. The perspective of the panel following that initial splash page is from outside Wayne Manor looking into Damian’s room, showing Bruce walking to his son’s easel while tree branches shed their leaves in the foreground. It works to create a sense of decay, a subtle look at things beginning to fall apart before they come crashing down in explosive moments of rage later in the issue. With such heavy subject matter, Tomasi makes sure to include brief moments of levity that introduce contrast and give even more impact to the dramatic moments. When Bruce is looking through his son’s notebook, he discovers a note from “C.K.” attached to a list of movies that Damian would like, including On The Waterfront, My Left Foot, and To Kill A Mockingbird. The blue paper, yellow Post-It, and red ink are clever visual hints at the identity of “C.K.”: the primary colors of Clark Kent’s Superman costume. It makes sense for Clark and Damian to develop a friendship considering they’re both people trying to fit into roles that are against their inherent nature. Clark is an alien posing as a human, and Damian was an assassin posing as a superhero sidekick. Damian was born to be an instrument of death and destruction, but his time spent with his father introduced him to the vast world outside of his mother’s grip. Clark’s list of movies was another part of Damian’s education, and now it’s just a sad reminder of what Bruce has lost. Granted, everything reminds Bruce of Damian. The second splash page of the book is a cheerful reflection of the cover image, showing Batman and Robin soaring through a crimson sky where the cover has Batman by himself. Appropriately, red is the color attached to Robin, and John Kalisz uses a heavily saturated color palette during those sequences where Batman hallucinates his dead partner. The colors tell a story of their own over the course of the next three pages; the red disappears as Batman sees his lone reflection in the side of a building and eventually all the color is drained from the page until Batman lands on a streetlamp illuminating the streets with a noxious brown glow. When he hops back into the Batmobile, the red lights of the vehicle’s interior reawaken memories of Damian, and that’s when the issue transitions from grief to anger. It’s a crowded 13-panel page that remarkably navigates the hero’s turbulent emotions as he transfers his feelings over Damian’s death to the innocent streetlight, ending with a chilling three-panel sequence showing the streetlight with the Batmobile’s headlights in the distance. Those three small, calm panels set the stage for the unbridled destruction of the issue’s first double-page splash as the Batmobile crashes into the streetlight, tearing up the asphalt and blowing up the electrical grid under the road. The image has incredible force, signaling a bold shift in the story as Batman deals with his son’s death through aggression, wrangling Gotham’s villains in a marathon crime-fighting session. Those battles are depicted with another double-page spread showing Batman in silhouette, the ends of his cape separating images of his enemies tinted with the different colors of the rainbow. The term “colorful” is often used to describe Batman’s rogues gallery, and there’s no place for color in his life right now. Rather than deal with the reality of his son’s death, Bruce escapes into the shadow of the bat until his world is engulfed in darkness. In the middle of the night, Commissioner Gordon wakes up to a phone call telling him to go to the Bat-signal, where Batman has littered the rooftop of Gotham Central with Gotham’s costumed criminals. This week’s Batman #18 offers another look at this new ruthless Dark Knight, but ultimately proves that Batman And Robin’s silent approach is the best way to truly capture the full force of Bruce’s one-man war. It’s difficult to depict a superhero’s mental breakdown after the death of his son without having the dialogue come across as overly melodramatic and brooding, and Tomasi’s script gives Gleason the opportunity to show Bruce’s crash through specific, meticulously rendered snapshots of anguish. After a depressing night, Bruce returns to the cave to find a letter left by Damian that applies the last bit of pressure to completely shatter him. He screams, punches a glass case and throws it to the ground, scattering its contents as he clutches the limp Robin costume in his arms. It’s a haunting end to the issue, putting a literal spotlight on Bruce’s sorrow and highlighting the emptiness that now exists where his son used to be. 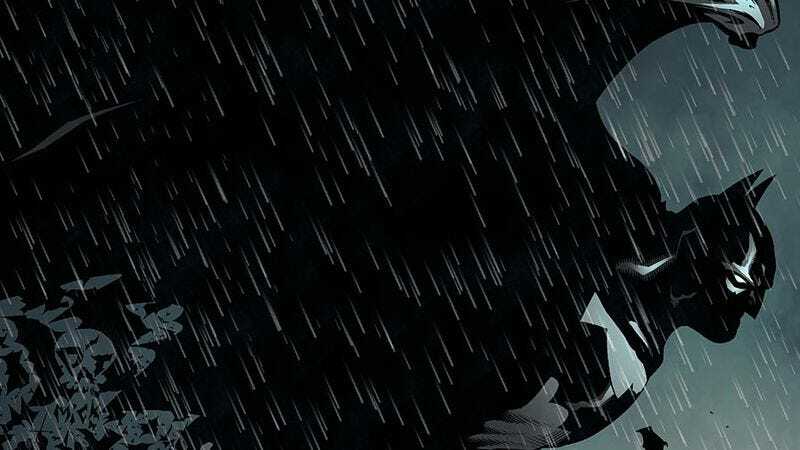 Damian Wayne’s death cost DC one of its most captivating characters, but it’s also resulted in one of the best Batman standalone stories ever. Tomasi, Gleason, Gray, and Kalisz deliver on all fronts with Batman And Robin #18, and it’s an incredibly moving requiem for the fallen Robin.